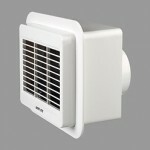 100mm Roomvent Fan High performance fans for higher performance ventilation. 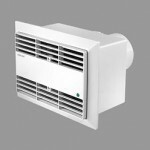 This range of centrifugal fans are ideal for larger rooms.or where two-room ventilation is required for example bathroom and adjoining W.C. by connecting the unit to 50mm ducting with an optional secondary inlet grille. The motor, fan and plug-in timer are on a separate chassis for easy installation.